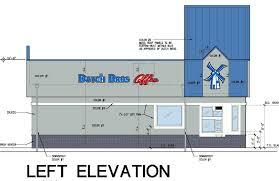 Hoping to expand its already strong presence in the community, Dutch Bros.'s application to open a second drive-thru coffee shop in Elk Grove will be considered at Wednesday night's City Council meeting. The popular coffee-based beverage operator, which opened its East Stockton Boulevard store in 2015 to great fanfare, is hoping to secure a second location on the northwest corner of Elk Grove-Florin and Sheldon Roads. The site where the local operators hope to build their 800 sq. ft. two window drive-thru facility is an unimproved parcel that is part of the Sheldon Crossing strip center. The Elk Grove Planning Commission unanimously approved the request at their April 6 meeting. As part of their approval, the planning commissioners requested and the applicant agreed to change the color of the structure to match the motif of the strip center. Next Wednesday's meeting starts at 6 p.m. at Elk Grove City Hall.